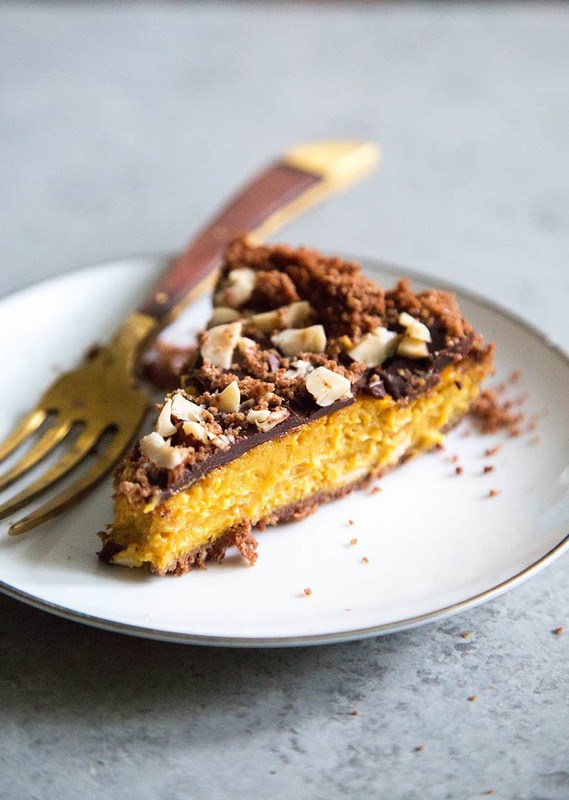 Chocolate Hazelnut Pumpkin Pie: chocolate hazelnut graham cracker crust with a pumpkin cheesecake filling topped with chocolate ganache and chopped hazelnuts. Cheesecake. It’s one of the heaviest desserts around, and unfortunately it’s also one of the tastiest. 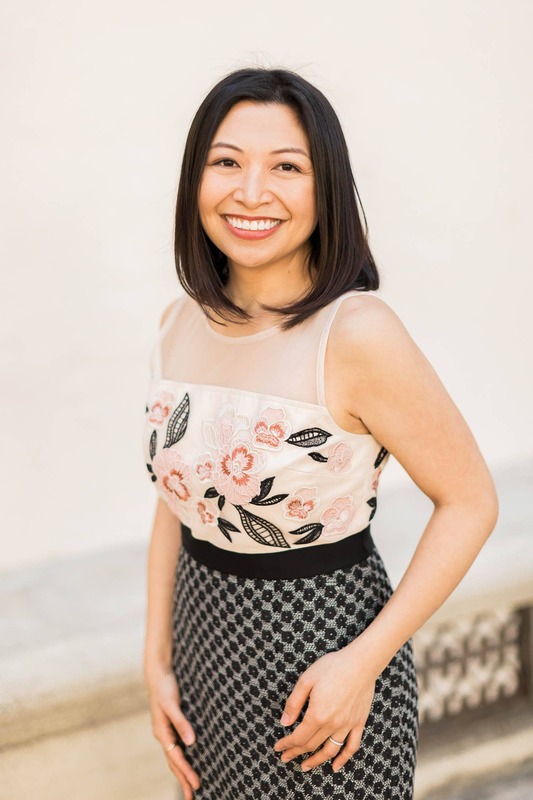 During the end of the year (mainly October, November, and December), it’s a time to celebrate and unapologetically gain weight. From Halloween parties, Thanksgiving, and all the gatherings in December, it’s really hard to maintain one’s summer figure. This year has the added pressure of our wedding (which takes place in two weeks!). In order to enjoy cheesecake while maintaining my pre-wedding diet, I’m sharing a lighter version of pumpkin cheesecake! While most pumpkin cheesecakes have at least a pound of cream cheese, this recipe uses a mere 8 ounces of cream cheese and almost of pound of pumpkin puree. Alex was super excited to come home and find this chocolate hazelnut pumpkin pie in the kitchen. At first he had very tiny sliver. Once I showed him the recipe, he happily cut another generous portion to eat while we watched Westworld. Pumpkin cheesecake is perfect the way it is. The creamy pumpkin puree mixed with the tart and tangy cream cheese is such a delicious combination. However, it’s soft. There isn’t much variety in texture. 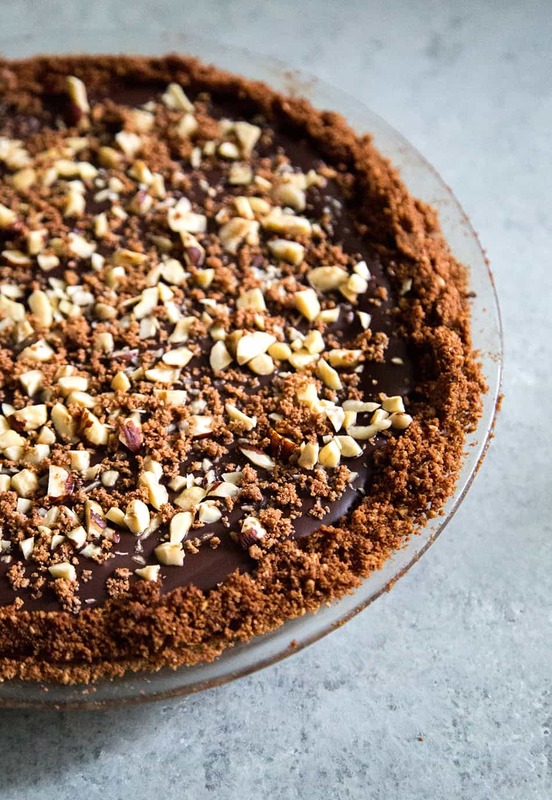 In order to add some crunch and excitement, I added ground hazelnuts to the graham cracker crust as well as roughly chopped hazelnuts to top the finished pie. In Alex’s opinion, this is the quintessential autumn dessert! I’m sharing this recipe in honor of Sara (Cake Over Steak) and Aimee‘s (Twigg Studios) annual #virtualpumpkinparty. Check out the links below to see everyone else’s pumpkin recipe! Preheat oven to 350 degrees F. Lightly grease a 9-inch pie plate and set aside. 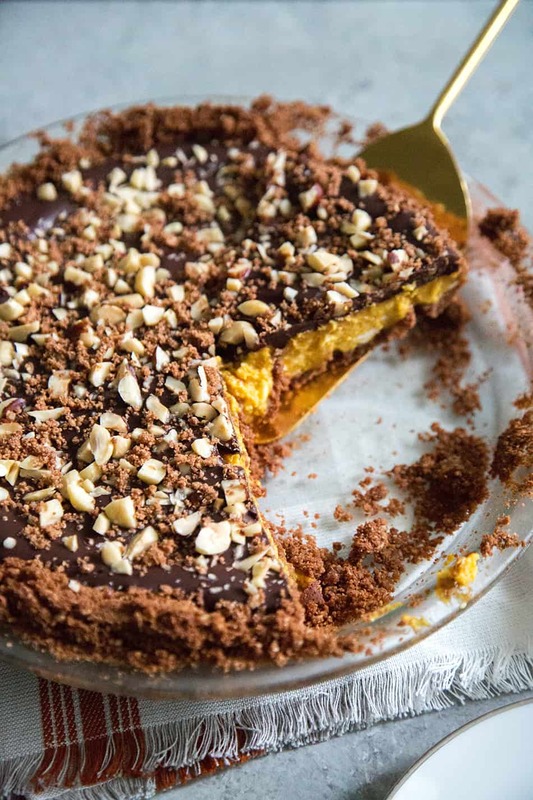 Crust: In a medium bowl, combine graham cracker crumbs, ground hazelnuts, cocoa powder, sugar, and melted butter. Press mixture into the bottom and sides of prepared pie plate. Reverse about 2 tablespoons of crust mixture to use later to top finished pie. Set aside. Filling: In a large bowl, beat cream cheese until smooth. Add sugar until combined. Scrape down bowl as needed to ensure thorough mixing. Add eggs one at a time until incorporated. Add pumpkin puree, cinnamon, and salt. Continue to mix on low speed until smooth and thoroughly combined. Pour mixture into prepared crust. Bake for 50 minutes until the center of the pie is set and no longer jiggles. Remove from oven and allow to cool on rack for an hour until filling has cooled to about room temperature. Topping: Place chocolate and cream in a small bowl over a bain-marie. Gently melt chocolate over low heat until smooth. Remove from heat and allow to cool for about 10 minutes. Pour melted chocolate over cooled pie. Spread into an even layer. Sprinkle chopped hazelnuts and reserved crust mixture on top. Chill uncovered in the fridge for one hour until chocolate has set. Place pie in an airtight container (or cover with plastic wrap) and allow to chill for another 2 hours (or overnight) until ready to serve. Such a delicious twist! I love this combo! This is a beauty – so sophisticated! Saving to try this holiday season. Oh….OH…..OH OH OH that looks so good! Right now I am wishing a slice of that could jump off the computer screen!! That is one gorgeous pie! Oh my goodness!! This looks absolutely amaaazing!! Wow, what a truly inspired fall dessert. OMGoodness! 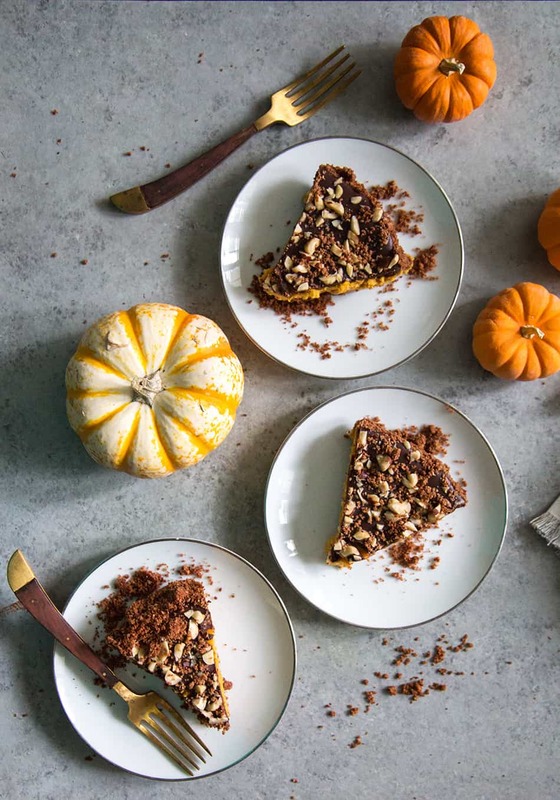 That pie is definitely a winner in my book for Autumn! Amazing!! Every single layer!!! This looks amazing and so perfect for fall. I would say, in particularly, for Thanksgiving but I might have to make this before. Just to test it out! 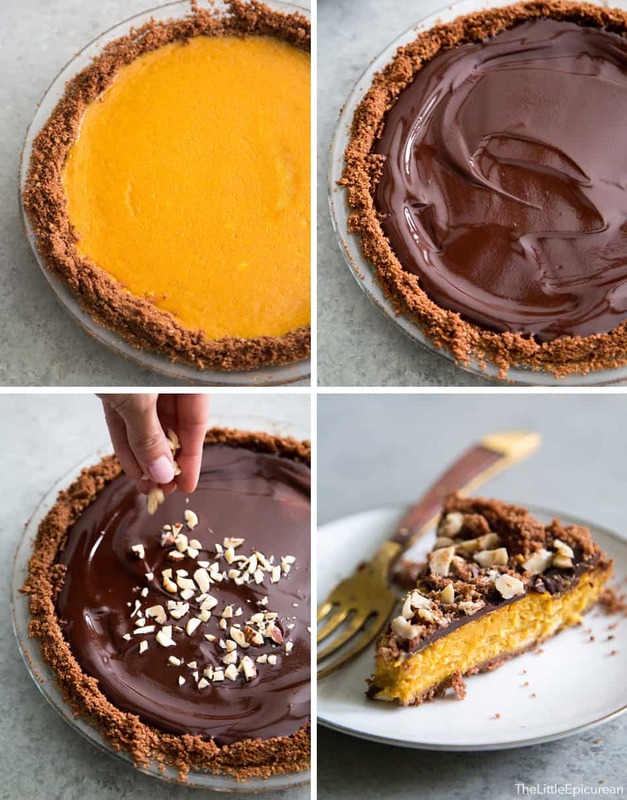 Chocolate Hazelnut Pumpkin Pie is my favorite item. Please continue your writing in the future!